Shield of baroque shape with contouring of golden color. In the blue field of the shield there is the schematized sketch for facade of morphological building of NMU with silver color, where instead of columns under the gallery there is the abbreviation �NMU�. Under the abbreviation there is a semi-wreath from celery leaves in the form of the golden globe. The stylish image of Asklepsiy�s crook with the golden snake is put on the image of facade and semi-wreath, over the handle of the crook there is the image of three flame tips with golden color. The shield has the framing in the form of the wreath from oak and laurel leaves of golden color, intertwisted with the blue ribbon. 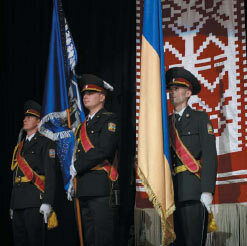 The shield top looks like a symmetrical composition, which consists of blue yellow ribbon and small state emblem of Ukraine. Over the shield there is the blue slogan ribbon with the slogan “HONOR, MERCY, GLORY” of silver color. Under the shield there is the blue ribbon with lettered image ” O.O. BOGOMOLETS NATIONAL MEDICAL UNIVERSITY” � of silver color. The ribbon is put to stylish image of green chestnut leaf with golden framing. In the very heart of Ukraine. Ours for ever, Alma Mater. Honor and fame of teachers.